Personally, I don’t understand why people would choose not to eat gluten. I mean, me? I can’t get enough of it! For starters, tons of foods that I love have gluten in them. And then there’s the whole thing — science — that says gluten isn’t actually bad for you (unless, of course, you have Celiac disease). If anything, you’re just causing yourself annoyance by having to pay for special gluten-free foods. But back to the good stuff…this recipe! When you combine biscuits (in all their gluten-y goodness), ground beef, cheese, and bacon, you’re bound to have a mouth party by the end. Just watch — and try not to drool all over yourself. First you’re going to need mini biscuit dough. 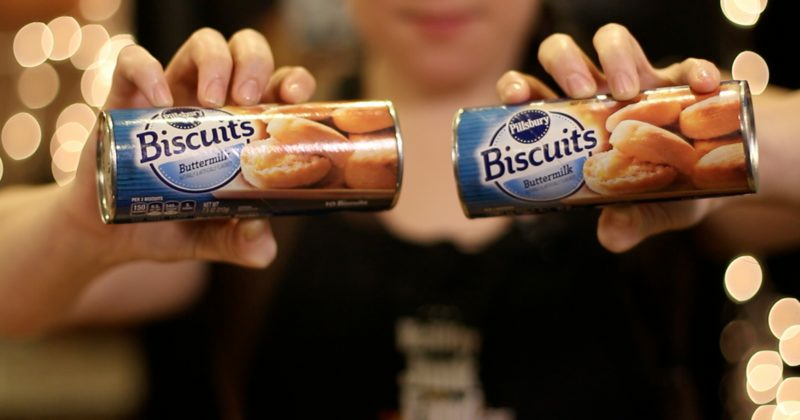 These geniuses used 24 biscuits. Roll out some ground beef and then cut it into one-inch squares. Cook a pound of bacon too, because…well, bacon. Flatten the biscuits out…these guys are about to get stuffed! Add little chunks of mozzarella and cheddar cheese. On goes little hamburger pieces. Repeat, finishing off with a squirt of ketchup. And load them into a cast-iron skillet — bake for 20 minutes at 400 degrees. Grind up the extra bacon and beef in a food processor. When they look like this, take ’em out of the oven. Top with cheese, beef, bacon, and cheese — in that order. Put the delicious dish back in at 400 for ten more minutes. Serve with ketchup, mustard, mayo, or whatever your heart desires. If your reaction is something like this, we don’t blame you.